In June, we were thrilled to launch Deliver Now, our on-demand courier service through our iPhone app. 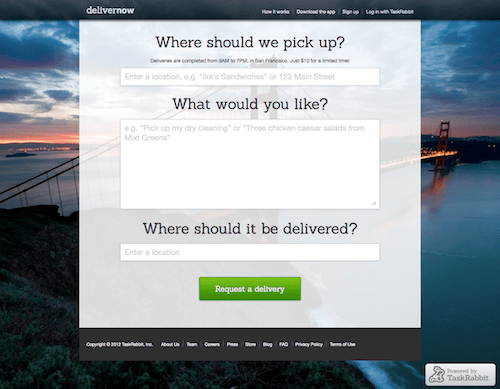 Today, we’re super excited to roll out the first Web-based, on-demand courier option: The Deliver Now Web App. So, what does this mean? It means anyone within San Francisco can enjoy the seamless on-demand experience of Deliver Now from his or her desktop. Of course, those out and about in San Francisco can still use Deliver Now on their iPhone through our iOS app. The Deliver Now Web App is just as easy to use as the feature on our iPhone app. The TaskPoster just enters the details of their delivery and a nearby TaskRabbit will be assigned automatically to complete it, usually in less than a minute. The assigned TaskRabbit will be on their way in a jiffy to pick up and deliver the item to the TaskPoster. The average delivery takes less than an hour. Pricing is the same — an introductory flat rate of just $10 — and the TaskPoster pays expenses directly through our secure site. We’re working on expanding Deliver Now to our other markets so stay tuned on where we’re heading next! So, what are you waiting for? Need a couple things from Whole Foods but don’t have the time to leave the office? Craving breakfast from Green Chile Kitchen or lunch from Mixt Greens but you’re stuck in a meeting? Forget a friend’s birthday and need to send a gift ASAP? That’s what we do. Find out what some instant gratification feels like right now. Next PostMeet the TaskRabbit Team: SheShe H.